I know, I know ... as if there weren't enough twits voting in the UK already. The UK is holding a general election on the 6th May. If you can't wait until then to cast your vote then you can vote on Twit Vote UK. 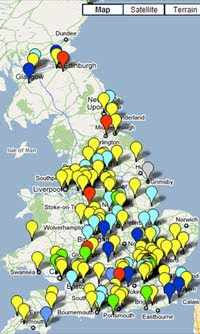 Using Twitter and Google Maps Twit Vote UK hopes to give an overview of people's voting intentions around the country. Your vote will then be displayed on the map based on your postcode. You can only tweet your opinion once every 24 hours. Worth noting that if you don't want to tweet your political opinions you can also submit on the website as well. Thanks for putting our site on your blog. Twitter users can now add their vote via a form on the website, and not have to post their postcode, which in the UK identifies their road. Another site is http://www.electwits.co.uk. It doesn't *require* you tweet your postal code, but doing so would get your vote registered on the map.